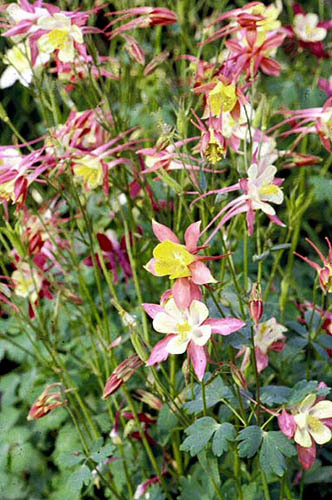 Similar to the native Canada Columbine, these hybrids have dainty fern-like foliage and masses of showy, spurred blooms. 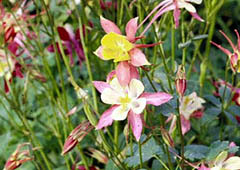 But hybrid columbines come in a wider range of colors, and bear larger, upright flowers, often on more compact plants. Provide constant moisture in full sun without waterlogging the soil. Prefers rich, moist but well-drained soil. Upright blooms borne on erect, branching stems. aggressive - Self-seeds if not deadheaded. not native to North America - Product of horticultural selection. cut flowers - Cut when flowers just open. Soak in warm water for 1 hour, then arrange. dried flowers - The dried seed pods are attractive in arrangments. Propagate by seed, division or separation - Grow only from purchased, labelled seed, as most hybrids do not come true from home-raised seed. Divide carefully in spring. Plants don't like to be disturbed and may take a long time to recover. Cut to ground if foliage becomes unsightly or infected by leafminers. New foliage will regrow if conditions are favorable. Keep soil moist during summer dry spells. Plant near other garden plants that will mask plants after blooming has finished. Biedermeier Group hybrids grow 1 to 1.5 feet with rounded mounds of blue-green foliage and short erect flower stems bearing numerous blooms. The flowers are only slightly pendulous, and can be shades of white, purple, yellow, pink and blue. 'Blue Star' grows 2 feet tall with medium-green mounds of foliage and showy, pendulous blue blooms on erect, branching stems. 'Crimson Star' grows 2 feet tall with medium-green mounds of foliage and erect, branching flower stems bearing blooms with red sepals and creamy spurred petals. 'Dragonfly' hybrids grow 2 feet tall with medium-green leaves and large, long-spurred blooms in shades of white, pink, purple, yellow and blue. 'Hensol Harebell' grows 2 to 2.5 feet tall with deeply-cut, medium-green leaves which are tinted purple when juvenile. Bears pendulous blue blooms on erect stems. 'McKana' hybrids grow 2 to 2.5 tall with medium-green foliage and numerous long-spurred blooms in shades or red, yellow and blue. Blooms can be bicolor. Strong but short lived performers. All America bronze medal winner in the '50s. 'Mrs. Scott Elliot' hybrids grow 2.5 to 3 feet tall with medium-green leaves and nearly upright to pendulous blooms. Often bicolored, red and yellow or blue and white. 'Music' hybrids grow 1.5 to 2 tall with medium-green leaves and wide variety of flower colors. 'Silver Queen' grows 2.5 tall with medium-green leaves and numerous, pendulous pure white blooms. 'Snow Queen' grows 2.5 feet tall with gray-green or blue-green leaves and numerous, pendulous pure white blooms. 'Songbird' hybrids grow 2 feet tall with medium-green leaves and numerous, large bicolor blooms in shades of pink, white blue and red.